How does one pay tribute to a Jewish Russian immigrant and American icon who lived to be 100+ years old, wrote over a thousand songs, nineteen of which were Broadway scores, eighteen Hollywood films scores, several nominations for Academy Awards, plus “God Bless America”, “Easter Parade” “This is The Army” and “White Christmas”, and still do justice to Irving Berlin? 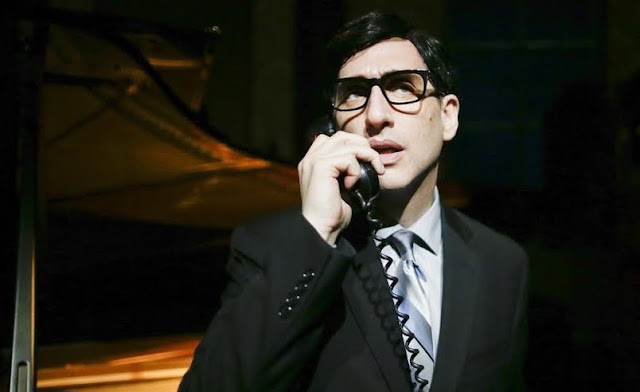 Hershey Felder like Irvin Berlin is in a league of his own. Felder, a Canadian native, born to Jewish immigrants and named by Time Magazine’s 2016 Top 10 plays and musicals, is no stranger to San Diego audiences. “Hershey Felder as Irving Berlin”, with music by Irving Berlin and book by Hershey Felder, who is also credited for the scenic design with Richard Norwood as lighting designer, with wonderful projections by Christopher Ash & Lawrence Siefert, and directed by Trevor Hay, is currently showing at the San Diego Repertory Theatre downtown San Diego through Jan. 7, 2018. From the musical bio, as Felder tells it, Berlin was self -taught, played by ear and could only play in one key. Over the years we have enjoyed his solo productions of Gershwin, Chopin, Leonard Bernstein, Lincoln, Liszt and now Irving Berlin. 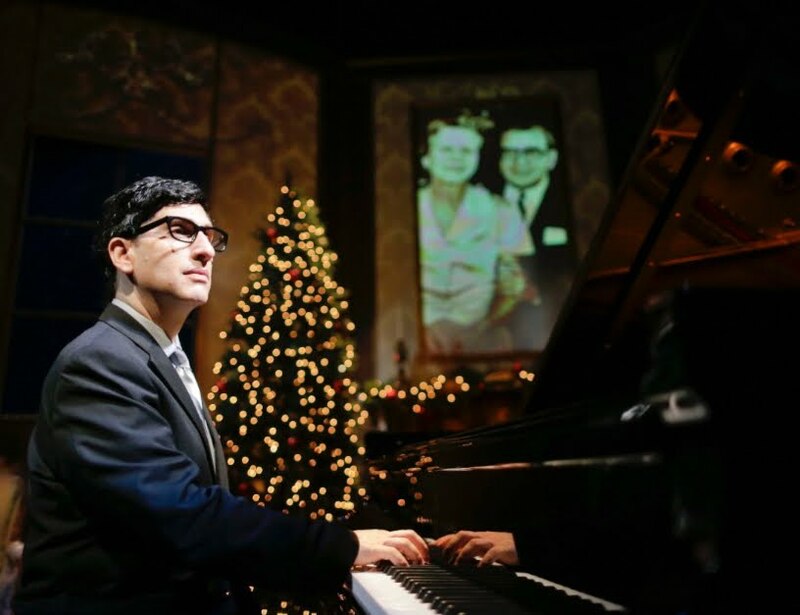 The show in our spotlight spans over seventy years of musical history and takes us through our growing up years as a nation via the music of one who was considered, according to Gershwin, to be one of the greatest songwriters in that has ever lived, and to composer Jerome Kern, “He IS American music”. Felder, indeed, does justice to Berlin. 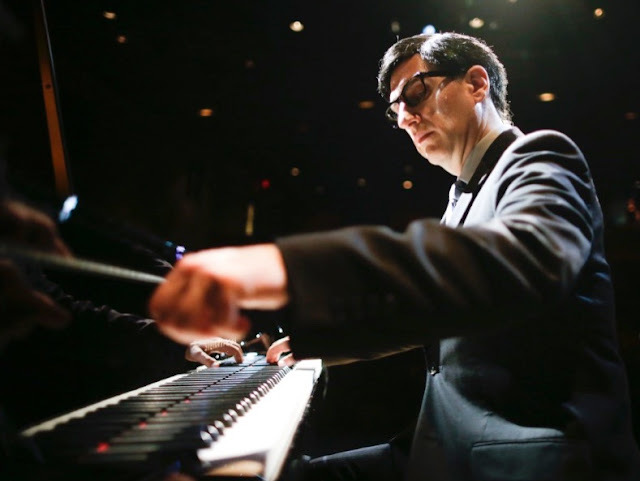 In case you missed the preview the very first time around, Felder gave San Diego audiences the first glimpse of his Irvin Berlin tribute and sing along biography during the Lipinsky Jewish Art Festival some years ago. He’s come a long way with it. He nipped a few minutes off the running time (although it still runs long at 2 hours without intermission) and polished Berlin’s biography by rooting out some precious gems about the little man who learned to speak English after emigrating here from what he (Berlin) recalls as a schtetle in Belarus. Recalling his life we see Felder as the young Berlin speaking to the elder in an empty wheel chair as caroler’s are singing “White Christmas” outside his townhouse. From singing waiter to accomplished lyricist, to his personal drama with the death of his first wife and two of his children (one on Christmas eve) to finding his true love (“Always”) in his controversial marriage to Roman Catholic debutante Ellin Mackay, Berlin wrote rags, patriotic songs, love songs, waltzes, fox trot, marches, stage musicals, movies and television. Felder’s Berlin stays focused with his love of music as a way of expressing himself to the moods of his adopted country even going so far as to enlist in the army. “This Is the Army, Mr. Jones” “Oh! How I Hate To Get Up In The Morning”. In his own words, “I write for the people”. “Alexander’s Ragtime Band” became Berlin’s first hit when it thrilled audiences throughout the world including Berlin’s birthplace, Russia (“Russian Lullaby”) to his rise as a songwriter in Tin Pan Alley and then on Broadway began in 1911 and he never looked back. In 1915 he wrote his next hit “I Love a Piano”. Throughout the evening Felder managed about 40 songs including “Blue Skys”, “Puttin On The Ritz”, “Let’s Face the Music and Dance”, “Count My Blessings” “Cheek to Cheek”, “Easter Bonnet” and “A Pretty Girl is Like a Melody”. My impression was that if he had the time, he would manage all 1500 in Berlin’s collection. He encouraged a willing audience to sing along with him, as he had done at the Jewish Art Festival showcase, an irony that I will always remember, “White Christmas” and “Easter Bonnet”. “Hershey Felder as Irving Berlin” was as I remembered it but more polished, has more drama and pathos and gives its credit where credit is due. From immigrant to one of the greatest songwriters of the 20th century, Berlin stands the test of time even going so far as to nix Elvis Presley’s rendering of “White Christmas”. Imagine if he was one of those immigrants barred from entering the U.S. for political expedience? It’s a rare treat. There is still time to catch it.